This was a card that I needed to finish, photograph and get into the mail really quickly! How unfortunate that it all happened during a huge rainstorm and the lighting was terrible! I'm not very happy with the quality of my photographs but it was the best I could do at the time. I hope it doesn't detract from the charm of this stamp set! 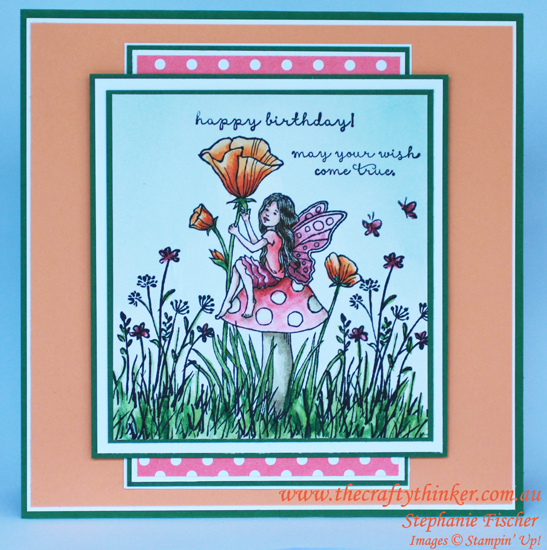 The fairy sitting on her mushroom is from the Fairy Celebration stamp set which I combined with a few images from the In The Meadow stamp set before watercolouring. I stamped onto Shimmery White cardstock with Basic Black Archival ink because both can withstand water very well. I then used a mop brush to wet the background areas before adding some Soft Sky ink to create a gentle sky background and let it dry completely. Then I used a fine round brush to paint the rest of the scene using Peekaboo Peach, Flirty Flamingo, Rose Red, Sweet Sugarplum, Blushing Bride, Pink Pirouette, Sahara Sand, Soft Suede, Wild Wasabi and Garden Green inks. The greetings are also from Fairy Celebration, stamped with Basic Black ink. The 6" square Garden Green card is layered with Whisper White, Peekaboo Peach, Garden Green and In-Colour DSP stack cardstock and paper. I cut a 5.5" square of whisper white cardstock for the inside of the card and decorated the corners using the Touches of Texture stamp set. 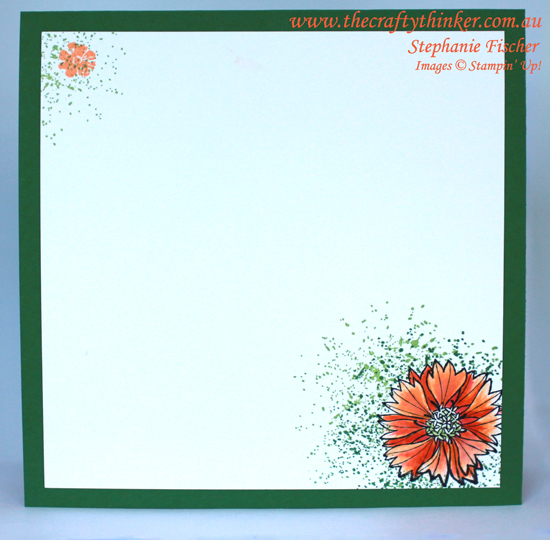 I stamped the larger flower first with Basic Black ink and then masked it before stamping with the texture image in Wild Wasabi and Garden Green inks. I then watercoloured the flower with Peekaboo Peach and Flirty Flamingo inks before adding a very light touch of Wild Wasabi to parts of the centre.